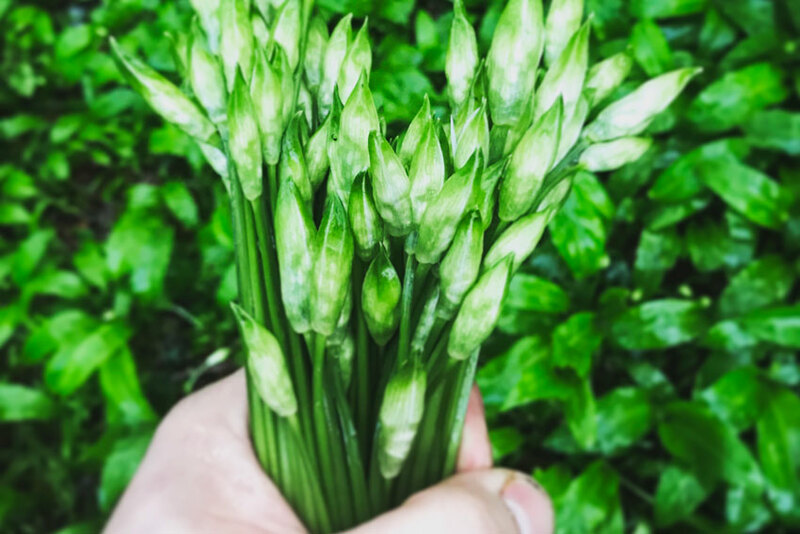 We’ve been foraging wild garlic for a couple of weeks now, and it’s coming through thick and fast now. It’s so abundant in woodlands, easy to identify and great tasting that we really like to make the most of it whilst it’s in season. 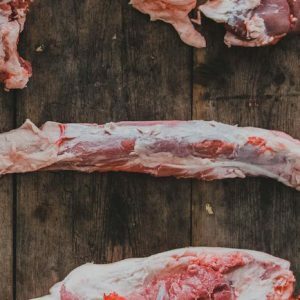 Here are a few recipes for using it in the kitchen. 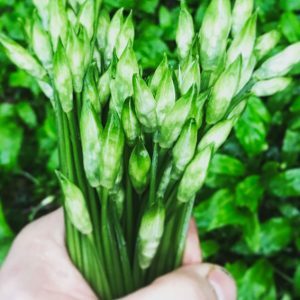 For this recipe you will need to gather wild garlic scapes – the scales (pictured above) refer to the stem and flower heads which are harvested whilst they are still closed, before the plant flowers. Pick the scapes as low down to the ground as possible and wash them. 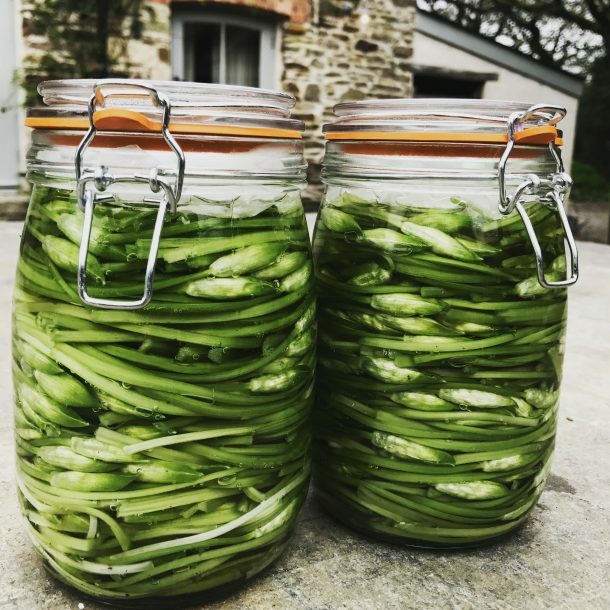 Arrange the scapes in a kilner jar so they spiral/wrap around the edge of the glass as pictured below, then fill in the centre as much as possible. Pour the pickle over the scapes so they are completely submerged and seal. In a food processor blitz the wild garlic leaves and the oil together until combined into a thick oil. Grate the yarg into the oil (keep it quite coarse to give the pesto texture), add the almonds and lemon zest and mix together. Taste the pesto at this point. Most of the saltiness will come from the yarg, but you can add a pinch of Cornish Sea Salt if it needs a bit more. It’s not just for pasta…this pesto is lovely with chicken and makes a great addition to a snadwich! Bring a pan of seasoned water to the boil, add the garlic leaves for 20 seconds then remove and plunge them into ice water. Remove the leaves from the ice and squeeze as much excess water out as possible. Add the garlic to the oil and blitz in a food processor until smooth, you will have a bright green oil. Whisk the eggs, mustard and vinegar together. Whilst whisking, gradually pour the oil into the mixture in a slow and steady manner. This needs to be a very gradual process as adding too much oil at once will split the mixture. The aioli will gradually thicken as more oil is poured in, keep whisking until all the oil is incorporated and you have a lovely aioli texture. This is great with anything off the grill – burgers, steaks, chicken – and really handy to have in the fridge for sandwiches and salads. Gather the wild garlic leaves, you are looking for bright green healthy leaves with no defects. Wash to remove any excess dirt and remove as much excess water as possible. Over this time the salt will draw moisture from the garlic, this is your pickling liquor. Stuff the garlic into a kilner jar, (this should fill a 2ltr jar) and fill with the pickling liquor to completely cover the leaves. Leave for at least 2 weeks at room temperature before transferring into the fridge. 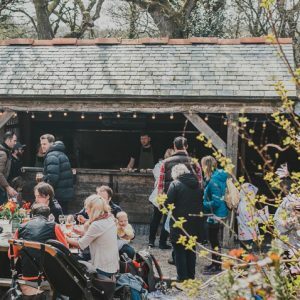 This will last for a year to keep you going until wild garlic returns the following spring! Use it as an accompaniment to cheese or in dishes as you would use sauerkraut.